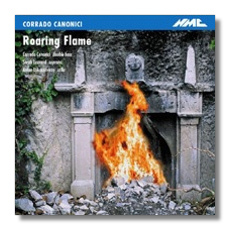 The music on this CD was deliberately chosen by Corrado Canonici to feature 'all kinds of compositional trends' and show how varied is new music in Britain today. Diana Burrell's Song for Harvey is transposed from a viola piece she wrote to play herself at a party; Maw's The old king's lament was the set piece for the first Isle of Man International Double-Bass competition in 1982. Fox's two Generic Compositions are played simultaneously. Rands has amplification controlled by a foot pedal. There is an early Knussen solo and one by Finnissy with one of his purposely oblique 'explanatory' notes. The others are by composers that Italian bassist-extraordinaire Corrado Canonici has known since settling in London 1997. The title work by James Dillon, the longest in this selection, is a dialogue for "female voice" and double bass. Singing in inscrutable Gaelic & Provençal, Sarah Leonard sounds like a counter-tenor. She avoids any vibrato and eliminates all traces of femininity. Canonici believes that 'a recording should not be too long' and apologises that time limitations forced exclusion of some composers he holds dear. This is rather mysterious, since everyone programmes their own CD listening - I rarely play a disc straight through - and CDs often accommodate most of 80 minutes music nowadays. Nonetheless, this is a good demonstration of innovation in Britain and the scope of the double-bass for experimental composers. The physicality of the double-bass, stretched to its limits, comes across well on this CD.